HOW CAN journalists in danger be supported, around the world and in one hostile environment in particular - Afghanistan? That was the discussion that took place at September's London Freelance Branch meeting. 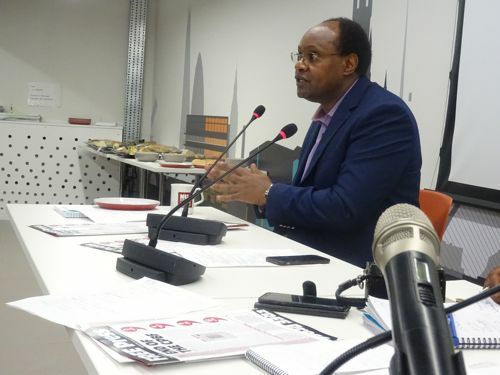 Our speakers were LFB's own Safiullah Tazib (Safi) and - all the way from Brussels - Ernest Sagaga, Human Rights and Safety officer for the International Federation of Journalists (IFJ), of which the NUJ is an affiliate. Safi opened by reminding us of the recent massacre of nine journalists, killed in deliberately-targeted attacks in Kabul on 30 April, along with a separate incident in which a BBC journalist in the country was killed on the same day. Another journalist had been shot dead a few days earlier on the way to work, with two more journalists killed shortly before that in a double suicide bombing in Kabul. The IFJ categorises Afghanistan as the "worst country for journalists", with 14 killed in 2018 alone. Safi described an incident in May last year in which six radio journalists were killed in the Afghan city of Jalalabad, and there have been many more such atrocities in the country recently - more than 47 local journalists and 16 foreign journalists have been killed in the course of their work in Afghanistan since 2001. Safi met with representatives of Afghanistan's Independent Journalist Association, Gaheez Forum of Writers, Kabul Press Club, Satre Awal weekly and news organisations Media Bazaar and NAI. "Why do we have to establish a link with Afghan journalists?" asked Safi: "every journalist's prime task is to inform, democratise, educate and entertain," which "makes it a moral obligation" to extend "links to journalists in very tough conditions." L to R: Hujatullah Mujadidi, Vice President of Afghan Independent Journalists' Association; Abdusamad Hamed Poya, General Director of Media Bazaa; Safi; Sardar Mohammad Dindarkhail, Director of Gaheez Forum of Writers; Aziz Tassal, President of Kabul Press Club; Ahmad Zia Rahimzai, Managing Director of Satre Awal weekly; and Abdul Mujeeb Khalvatgar, Executive Director of NAI. Afghanistan's journalists have exposed corrupt MPs - one involved in drug running to Moscow and another who diverted a national airline plane to come and pick him up from Kabul - as a result, neither of them were able to stand for election again. Afghanistan's 220 media outlets are "restrained on a daily basis" as a result of their reporting on corruption. Organisations from the UK have a stake in the future of Afghanistan. The UK has lost 457 soldiers in Afghanistan in the most recent bout of engagement. By the end of 2020 the UK government will have spent an estimated $40 billion on the country. There are still 1120 British soldiers in Afghanistan, which Safi described as a "presence which helps the free press." Afghans "appreciate our letters," said Safi. While "they had their own reservations" they "agreed to accept our offer" of support from LFB. The "support they need is to help with protection on their work.. to lobby the UK government so the UK force the Afghan government to provide more protection." They also requested "training with investigative reporting, financial assistance to children of killed journalists and employment rights." Safi explained that most Afghan journalists are staffers but their contracts have no holidays and "no sick pay. They have contracts but... solely written for the benefit of the employer". 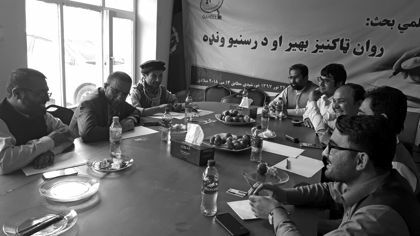 There are currently 17 different journalists' unions in Afghanistan, but these are "working to create one big federation that will represent them all as a united union, a process they are about to complete." In what form can we practically help them? "Would it be possible to occasionally send experts to train them?" asked Safi. Afghan journalists also "want us to persuade UK government to encourage the Afghan government to provide financial assistance to children of slain journalists. The attacks on journalists are "deliberate, targeted by the Taliban" because their reporting is seen as "against the Taliban," or is against the interests of "warlords within the government" or "corrupt officials." Our colleagues in Afghanistan are "not happy with Western journalists' reporting from Afghanistan... Western journalists are very selective in their coverage, do not show graphic footage or report on corruption." The IFJ "have representation" in Afghanistan, "but no one can see what they are doing... they were not aware of IFJ having done anything... IFJ are quite invisible." Ernest Sagaga, Human Rights and Safety officer for the IFJ and a former BBC journalist, began by saying, "I feel I am in the dock." The Association of Independent Journalists in Afghanistan is their representative, "we did safety training" through them. But, explained Ernest, "these are independent unions, they cannot intervene in their internal affairs" if there are issues. There had been "help with donations from Chapels of NUJ UK and Ireland" for the IFJ's Safety Fund, which helps journalists facing danger worldwide. "You freelances are in particular danger", especially with the recent trend towards the "kidnap of journalists in countries like Syria" motivated by desire for ransom, political leverage of just media attention. Nowadays such countries are so dangerous that media outlets "tend to send freelance journalists, or locals, especially young ones who take on huge risks without any support at all". Since the IFJ started compiling annual reports on journalists killed in "work related" incidents back in 1990, there have been over 3000 journalists killed. As Ernest put it, "apart from the army I don't know any profession where so many are killed." In 1990 the IFJ's Safety Fund was started "by journalists for journalists", it covers medicines, legal defence, in the past it used to be for journalists in developing countries but now requests are coming from Europe and America because of the "precarity of our members". It has dispersed over £3 million since its inception: "it's your money with your name on it." 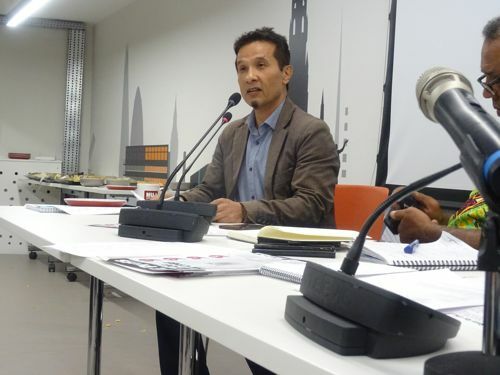 The IFJ organises safety training, which is "very expensive - we get money to fund these trainings and we invite journalists to attend these trainings, mostly freelance journalists, to prevent them being killed." The IFJ funds and runs Hostile Environment Courses. A lot of these are "training for trainers" to create a "pool of trained people who will train people in that country, we ask unions to recommend people to come to get training... freelances have got priority, we know that no one is going to get training" otherwise. The Safety Fund Board is made up of officials of IFJ: they "decide where to spend money and how the money will be spent". Ernest is coordinator, his job is to "ensure the spending is admissible and make recommendations to board". There "used to be a rule we could only help you once - this has now changed." The Board are "very careful on donations from external funds - they are really vetted". Back in 2010 Romanian media company owner Sorin Ovidiu Vintu "proposed a big sum for children of killed journalists, €60,000". This was donated, but Ernest received an "instruction to pay it back with no discussion". (Vintu has since received prison sentences for embezzlement and money-laundering.) They no longer accept money from the EU either, after the European Commission acted against a German journalist for exposing corruption in the Commission. The Fund does get money from external sources "but to use as we see fit" with no strings. Currently, the IFJ is active in a campaign, together with the UN Human Rights Council, the NUJ, the BBC and others, to protect BBC staff in Iran working with the World Service Persian service, which is "under threat". There's a new convention on the freedom of the press under discussion at the UN in New York, which could get passed with some "implementing tools" if some member states adopt it. At the same meeting, Baris Cimen, an exiled journalist from Turkey, was elected onto the LFB Committee as a member without portfolio. We were also introduced to the Morning Star 's Sarya Tunc, recently forced into exile from Turkey, who is seeking support for her claim for asylum in the UK. There is a fund set up to raise money in support of Sarya.